Chinese sensor manufacturer OmniVision Technologies has announced four new image sensors for smartphones that feature improved dynamic range and noise performance. 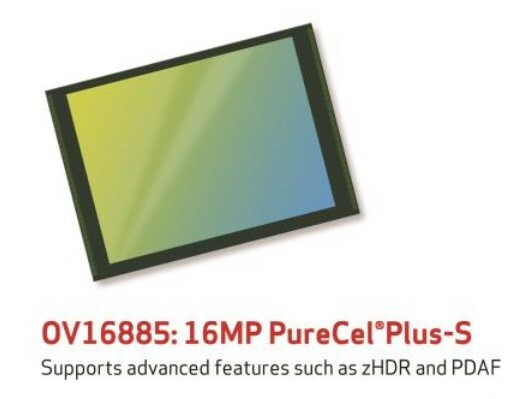 The 16MP and 20MP sensors offer higher full-well capacity which allows pixels to collect more charge before clipping: increasing dynamic range. A new structure allows pixels to convert more of the light captured into electrical charge, resulting in a claimed 12.5% improvement in sensitivity, giving better low light performance. Better separation between pixels also improves noise by helping to prevent color crosstalk, and thus should produce a cleaner image in dim conditions. The standard versions of each chip allow further improvements in dynamic range using a method that records two different exposures simultaneously called zHDR. The sensor divides the pixels in a zig zag pattern so that some record a long exposure and others a short one, and the two exposures are combined to form an image with a wider range of tones. These are second generation sensors that already use phase detection AF and which can record 4K video. ‘4C’ variants of both chips include a non-standard color filter array pattern that makes it easier to combine the signal from four pixels, to give less noisy, lower resolution images. The company says that they will be ready for mass production in the early part of next year. For more information see the OmniVision website. OmniVision Technologies, Inc., a leading developer of advanced digital imaging solutions, today introduced its latest advancement in leading-edge pixel technologies: second- generation PureCel®Plus and PureCel®Plus-S. In keeping with OmniVision’s tradition of delivering industry-leading image sensors, the second- generation PureCel Plus technology offers significant improvements over the previous generation, such as higher full-well capacity (FWC), better sensitivity, increased signal-to-noise ratio (SNR) and enhanced low-light performance. Though the initial development was focused on supporting small-pixel products for mobile applications, this technology will ultimately benefit many other image sensor applications. 20 percent increase in FWC, enabling higher dynamic range. A newly introduced composite metal grid (CMG) structure, which increases pixel quantum efficiency and enhances sensor low-light performance, leading to a 12.5 percent improvement in sensitivity. Improved deep trench isolation (DTI) structure, which further reduces color crosstalk and improves the SNR10 (low-light performance index) number by 10 lux. These structure improvements also enable small-pixel sensors to have better tolerance to incident light angles. This in turn allows imaging systems to use lower F-number lenses for better brightness, and to realize lower module heights that are essential for slimmer phone designs. OmniVision’s second-generation PureCel Plus-S technology will empower new families of compact 20-megapixel and 16-megapixel sensors. The 20-megapixel OV20880 and OV20880-4C and the 16-megapixel OV16885 and OV16885-4C are designed to deliver high-resolution images to high-end smartphones across a variety of lighting conditions. The OV20880, OV20880-4C, OV16885 and the OV16885-4C are currently available for sampling and are expected to enter volume production in the first quarter of 2017.